Water damage in your home is a stressful situation. Aside from the mess it makes, you may also have to deal with damaged furniture, and mould or other health risks. If you’re wondering how to prevent basement flooding, there are some tips to help you reduce the risk. Keep on reading for ways to stop basement flooding before it occurs. How do you fix basement flooding? The best thing you can do is to be proactive. This includes cleaning and maintaining your gutters and downspouts to make sure they are not clogged with any debris. If they are clogged, water can pour over the sides, fall close to your home, and run into your foundation. This water can enter your basement through cracks in the foundation and increase your chances of a flood. 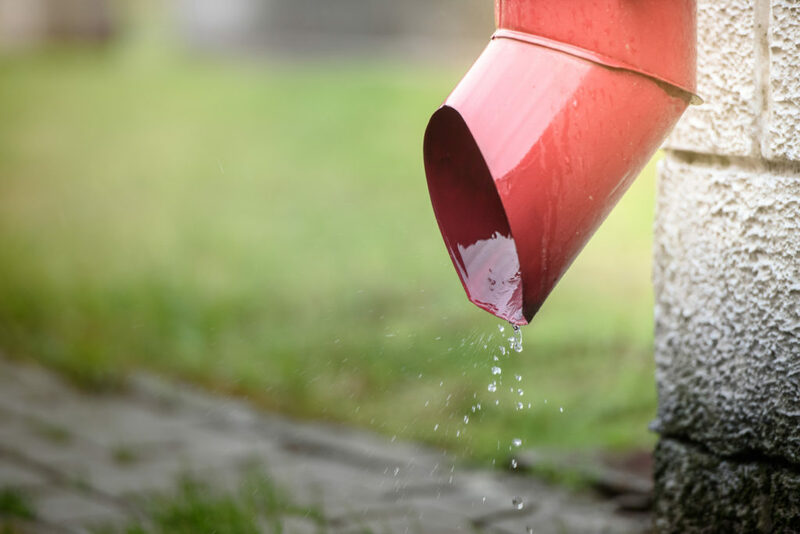 Your gutters and downspouts should direct water at least three feet away from your foundation. If you have foundation cracks in your home, this is an open invitation to water intrusion. To prevent water damage to your basement, visually inspect the exterior of your foundation, and basement walls and floors regularly. If you do notice any cracks during this inspection, fill them properly. If you need a professional, there are companies that can help you. If you still experience leaks in your basement, or notice a more serious problem with your foundation, you should seek help from a professional. The most frequent cause of basement floods is sump pump failure. If your home has one and it’s working properly, you have a great defense to combat mould, water damage, and flooding. This means you need to maintain your sump pump regularly, to prevent any flooding if there is a storm. If you know there is a storm heading your way, make sure your sump pump is working properly, and is plugged in. You should also consider getting a generator for your sump pump, and a replacement just in case you lose power or the sump pump fails. It is important to know that if your basement floods because of a broken sump pump, your homeowner’s insurance may not cover the damage. If you have not had your sewer inspected or your septic tank cleaned recently, you should book an appointment as soon as possible. If you miss important sewer inspections and septic tank cleanings, you will be inviting floods into your home. This is because clogs, sewer backups, and overflows, are bound to happen with a lack of maintenance to your systems. If your home has a below-grade basement window, you should install a window well cover. If they are fastened securely over your basement windows, and latched to your home’s foundation, they will work wonders in waterproofing your basement, and preventing damage to your home. Depending on the type of window well covers you buy, they can prevent light from entering your basement. Look for clear acrylic window well covers to keep your basement well-lit by natural light, if this is a concern for you. Installing a backwater valve of is a good way to prevent water damage to your basement. This device prevents sewage and an overloaded main sewer line from backing up into your basement. The valve works by automatically closing if sewage backs up from the main sewer. When it is installed it must be placed so that the sewage backup is stopped and does not come through other outlets in your basement. These other outlets may include your sinks, toilets, showers, and laundry tubs. You can install a water sensor in your basement to alert you if there is a flood. The best place to install a water sensor is by the hot water tank. This is because the pressure valves of hot water tanks can give out for several reasons, ranging from poor maintenance, to age, to faulty installation. Some tanks even form tiny puddles, so you should set up your water sensor beside it to alert you of any leaks. You should ensure proper lot grading outside your home to prevent a basement flood. As soon as you can you should build up the ground around your house so water can drain away from the walls of your basement. If you need more tips to prevent a basement flood, or if you need emergency help for a flooded basement, Flood Services Canada can help you. Depending where the water is flowing in from, you can be dealing with a situation that is harmful to the health of your family. The longer you leave water standing in your basement, the higher the risk will be for unrepairable damage, so act fast if you notice a flood, and give us a call. Our professionals can save you from future damage to your home caused by issues you cannot see, and we can help you settle with your insurance company. We deploy our quick-response teams across Toronto, Oakville, Ajax, Whitby, Georgina, Barrie, Mississauga, and the Lakeshore to help homeowners in a tight situation. We’re ready to provide 24/7 sewage, water damage, and flood cleanup services and will use the best techniques, personnel, and technology to ensure your home or business is clean, safe, and dry as soon as possible. Contact us at (416) 302-2107 to learn more about our water damage cleanup services, or use our emergency hotline at (416) 999-3930 to get our rapid-response teams deployed to your location.